Why is water and weight loss such a great pair? Water is not only the main ingredient for an effective weight loss, it is also what we are made of – well at least 60% to 70%. That’s about two thirds of our body that is water. Water plays an important role in many body functions and these body functions are important for losing weight. Water is essential to your weight loss for many reasons. It can help curb your appetite and make you feel full faster. This means you will eat less, consuming fewer calories. But this is just the tip of the iceberg when it comes to water and weight loss. Why is water so important in the water and weight loss scheme of things? Well there are many benefits of water to your body beyond just losing weight. Things like kidney function, your digestive system, body temperature and more. These important body functions need water to ensure they proper correctly. And when these systems are operating correctly, it can help aid in your weight loss. By having the right amount of water you are ensuring that your kidneys are functioning properly. If the kidneys don’t have enough water then the liver has to step in to help. The problem with this is that one of the liver’s functions is to help burn fat. So if you don’t have enough water then the liver is less efficient at helping burn excess body fat. Water also helps with the digestion and absorption of food. What does this mean for weight loss? Well it means if you don’t get enough water you won’t get the full benefits of the nutrients in the foods you eat. Additionally if you don’t get enough water you run the risk of getting constipated. Water assists excretion of waste from your bowels and kidneys. Water regulates your body temperature. If you don’t have enough water your skin cannot properly cool you down. There are claims that drinking ice cold water assists in losing weight. The thought is that ice cold water creates an increase in burning calories as your body has to work harder to heat up back to body temperature. This ice cold water and weight loss theory however is widely debated. Your blood is about 83% water and blood is your transport system for moving nutrients around in your body. If you are dehydrated your blood is thicker, making your body work harder to circulate the blood. Not only is it harder for your body to receive the nutrients from the foods you eat, but your oxygen is not being circulated as efficiently. As a result, your brain becomes less active and your body feels fatigued and tired. This makes it harder to get a good workout and burn calories. I know I already mentioned this earlier, but I just wanted to reiterate why water and weight loss are a great pair. Reducing your cravings and appetite in order to lose weight is a critical success factor. The beauty of using water to curb your appetite is it’s free and readily available. No need for over the counter suppressants. Water is a natural appetite suppressant. In fact, Doctor F. Batmanghelidj MD, author of “Your Body’s Many Cries For Water” says most times your “hunger” is your body asking for water – not food. I don’t mean water and weight loss; I simply mean losing excess water weight. Water weight loss is not fat loss or pounds lost but rather shedding water your body is retaining. If you are feeling bloated and carrying excess water weight, then the best solution is to drink more water. That’s right! Drinking water sends a signal to your body that it is getting the proper supply of water so it no longer needs to retain water. So the best way to lose water weight is to drink water. Now that we have established that water is a weight loss aid, let’s talk about some of the other benefits you can get from drinking water. As you can see, water and weight loss is just one of the many wonderful things water can do for you. Getting the proper amount of water is sometimes easier said than done. Some people just don't like the taste of water. Others may not find enough time to drink enough water. Here are a few tips to help you get in your daily quota of water. Start your day off with a tall glass of water. Instead of reaching for the coffee cup first, get a glass of water while the coffee is brewing. Drink a glass of water before each meal. If you are eating 5 to 6 smaller meals a day, which is recommended for weight loss, then this means you will get 5 to 6 glasses of water easily by drinking before you eat. Drink a glass of water before and after you exercise. Additionally you should hydrate yourself during your exercise by taking sips here and there. End your day with a glass of water. Before tucking away for the night, drink that last glass of water. Before you know it you will be getting in your 8 to 10 glasses of water each day. So remember, water and weight loss go hand in hand so be sure to hydrate yourself with a tall glass of water. And remember, just like cutting back calories too much can be harmful so can getting too much water. You don’t need to overdo it with the water. The guideline is to drink eight, 8 ounces a day to maintain your weight. For each 25 pounds you are overweight, add one 8 ounce glass. 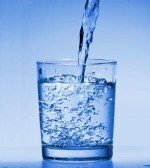 In addition to this article on water and weight loss read this article on the benefits of drinking water. Here's yet another way water can help you lose weight. Get wet and burn calories with water aerobics. This type of workout can burn even more calories than your daily jogging routine. Help jump start your weight loss with these quick tips to lose weight the healthy way. No diet pill gimmicks or nasty tasty so called "health shakes". These are all natural methods to help you lose weight faster. Find out what's fact and what's fiction when it comes to losing weight.